I’m going to visit my uncle for a couple of days. I wish I could stay with him longer. 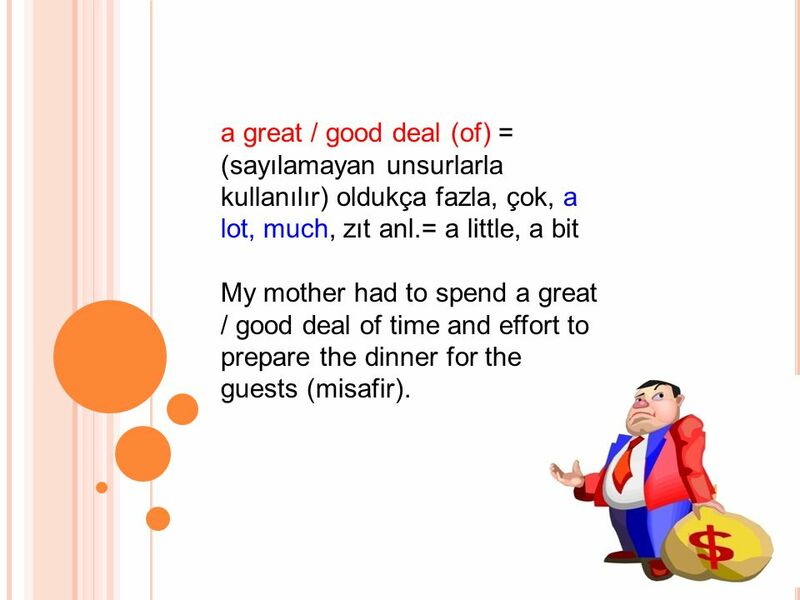 2 a great / good deal (of) = (sayılamayan unsurlarla kullanılır) oldukça fazla, çok, a lot, much, zıt anl.= a little, a bit My mother had to spend a great / good deal of time and effort to prepare the dinner for the guests (misafir). 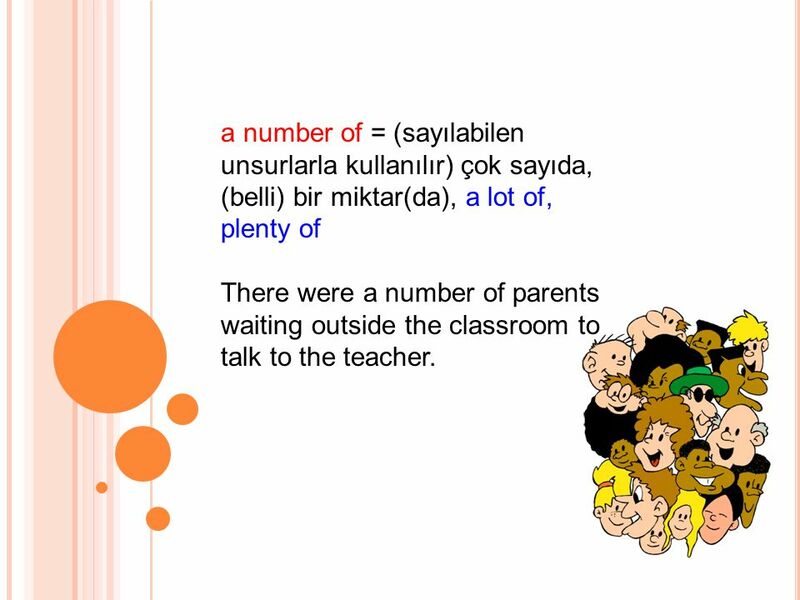 3 a number of = (sayılabilen unsurlarla kullanılır) çok sayıda, (belli) bir miktar(da), a lot of, plenty of There were a number of parents waiting outside the classroom to talk to the teacher. Above all, I’d like to thank our readers for their support (destek). The fugitive (kaçak) stayed at an abandoned house for a few days until the police found him. The film was absolutely amazing. I must see it again soon! 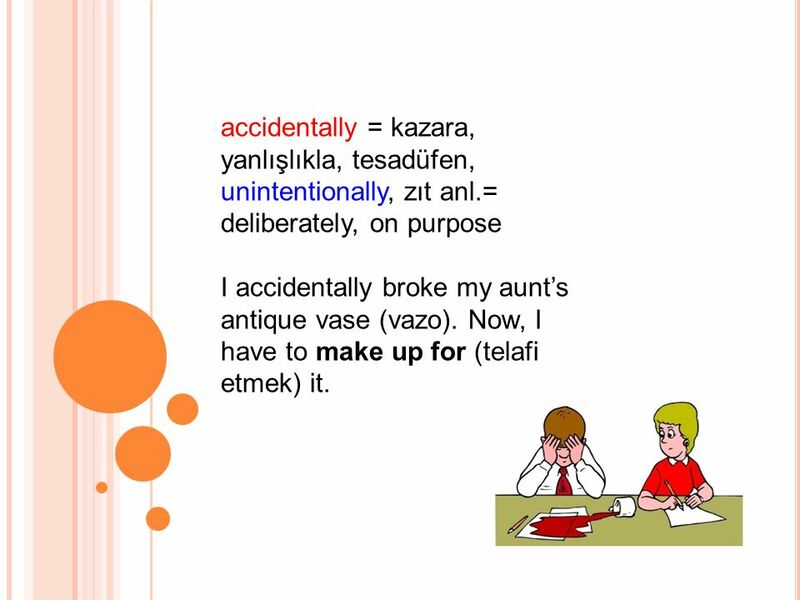 - “Are you coming with us?” - “Absolutely.” absolute (sıfat) = 1) tam, halis, saf, mutlak, pure, zıt anl.= imperfect; 2) (bir şeyin) hepsi, tamamı, complete, zıt anl.= limited The mother puts absolute pressure on her children. They don’t even leave the room without her permission. 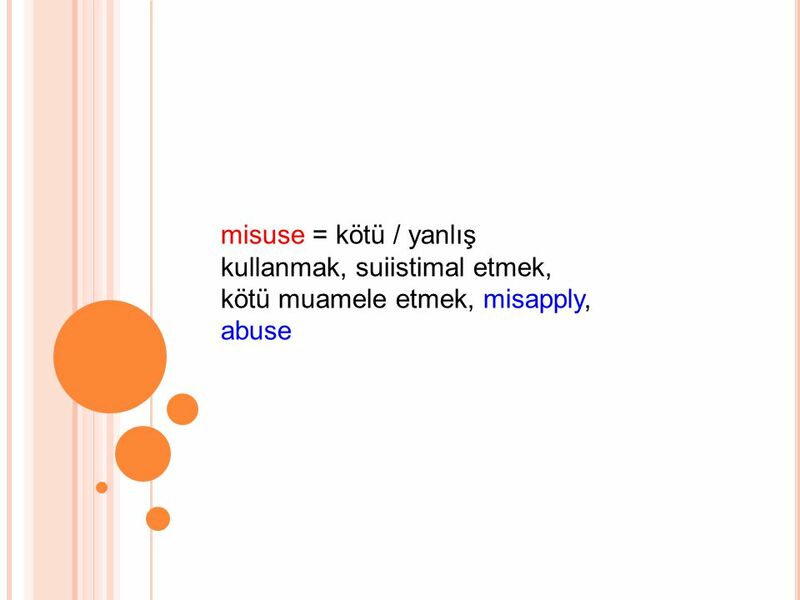 absent (sıfat) = yok, mevcut değil, unavailable, zıt anl.= present, available Can is ill at home. So he is absent from class today. 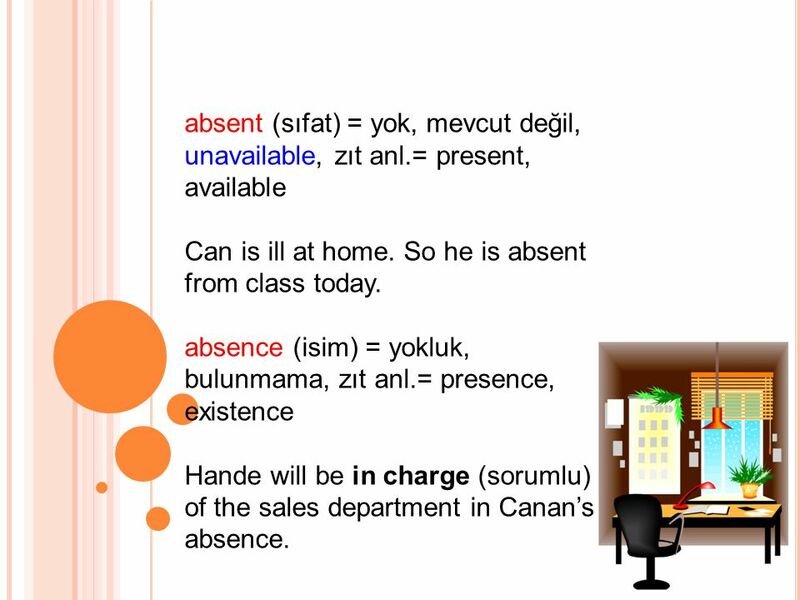 absence (isim) = yokluk, bulunmama, zıt anl.= presence, existence Hande will be in charge (sorumlu) of the sales department in Canan’s absence. 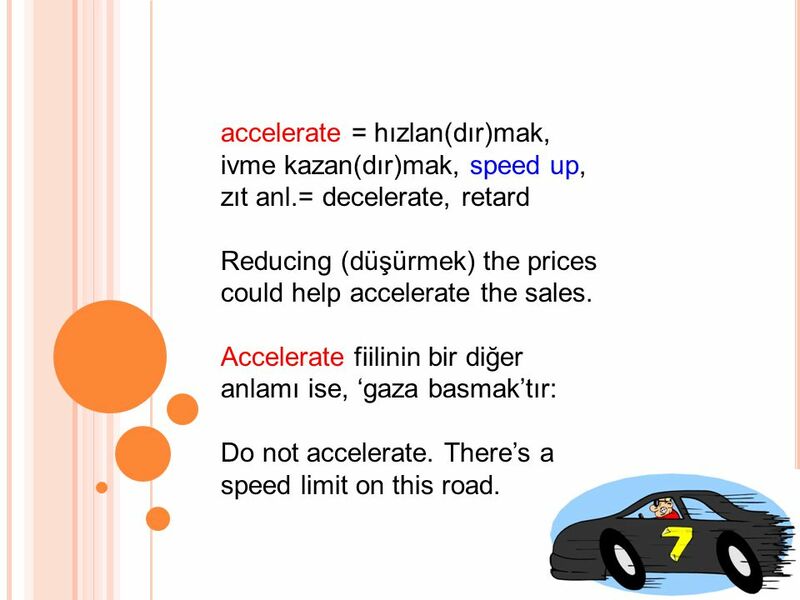 accelerate = hızlan(dır)mak, ivme kazan(dır)mak, speed up, zıt anl.= decelerate, retard Reducing (düşürmek) the prices could help accelerate the sales. Accelerate fiilinin bir diğer anlamı ise, ‘gaza basmak’tır: Do not accelerate. There’s a speed limit on this road. The tuition fee (okul ücreti) includes the books, but not the accommodation. I have to arrange (ayarlamak) it myself, and I don’t know where I’ll be staying yet. 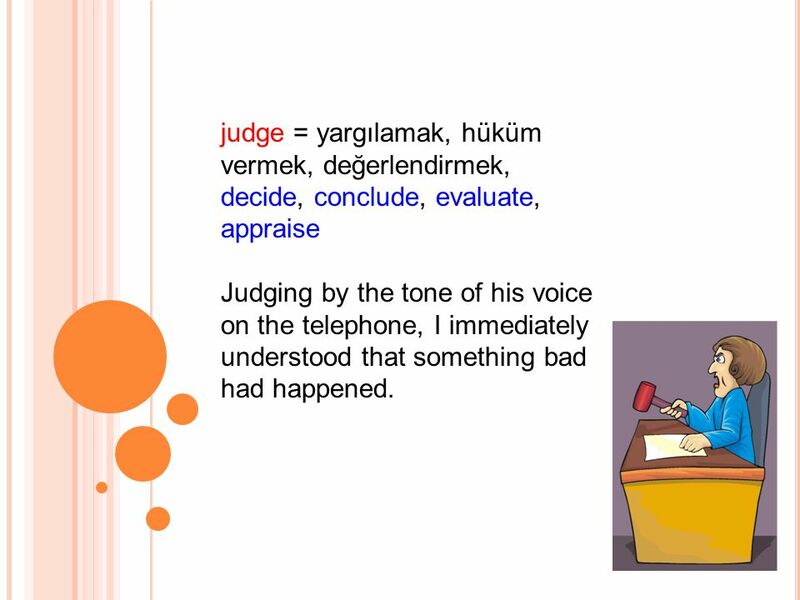 accommodate (fiil) = 1) yer / yaşam alanı sağlamak, be home to; 2) (ihtiyaçlarına) cevap vermek, hizmet etmek, serve The jury will be accommodated in a nearby hotel during the trial (muhakeme / yargılama) period. The dormitory (yurt) cannot fully accommodate the students. That’s why it is going to be enlarged (genişletilmek). 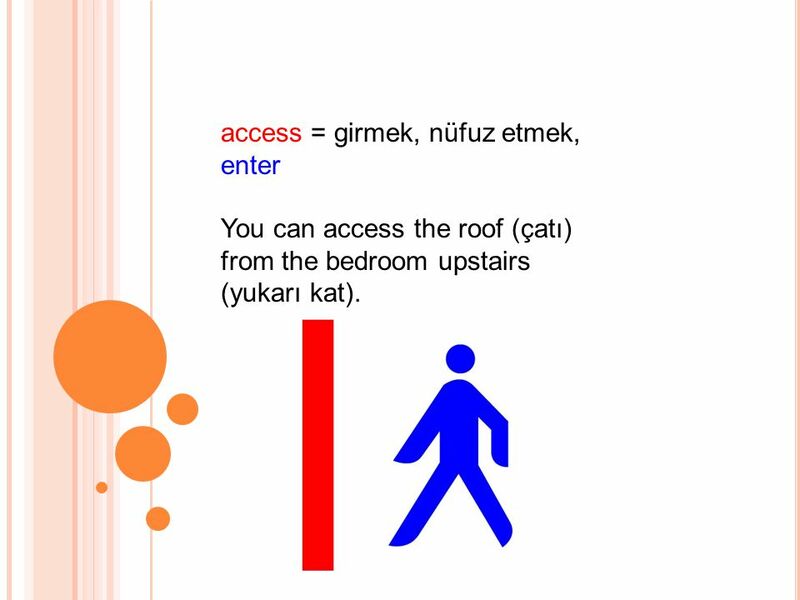 You can access the roof (çatı) from the bedroom upstairs (yukarı kat). 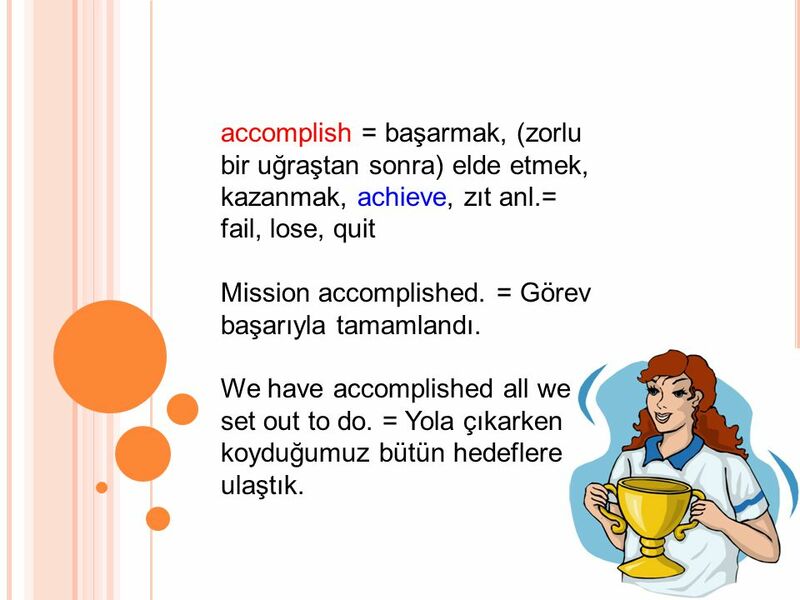 11 accomplish = başarmak, (zorlu bir uğraştan sonra) elde etmek, kazanmak, achieve, zıt anl.= fail, lose, quit Mission accomplished. = Görev başarıyla tamamlandı. We have accomplished all we set out to do. = Yola çıkarken koyduğumuz bütün hedeflere ulaştık. abolish (fiil) = kaldırmak, feshetmek, cancel, get rid of, zıt anl.= establish Sultanate (Saltanat) was abolished on November 1, 1922 in Turkey. abolition (isim) = (ortadan) kaldırma, ilga, fesih, cancellation, repulsion Some parents (veli) have written to the Meadows school administration (idare) against (karşı) the abolition of their school library and the decision to make the librarian redundant (kütüphane memurunu işten çıkarmak). Calcium is found most abundantly in milk. 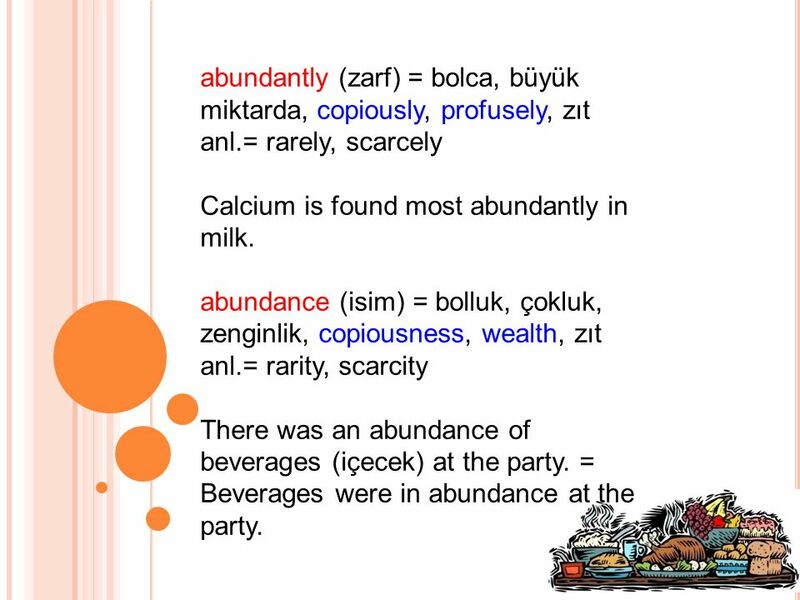 abundance (isim) = bolluk, çokluk, zenginlik, copiousness, wealth, zıt anl.= rarity, scarcity There was an abundance of beverages (içecek) at the party. = Beverages were in abundance at the party. 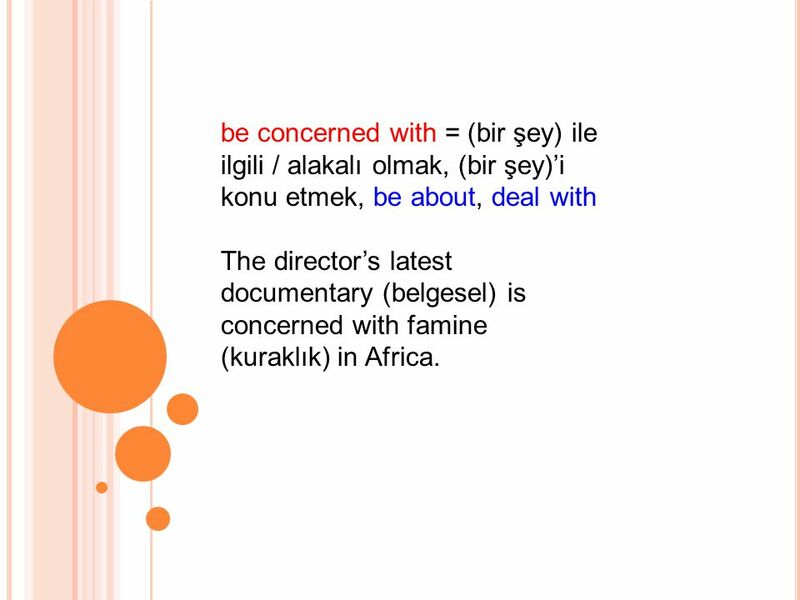 14 be concerned with = (bir şey) ile ilgili / alakalı olmak, (bir şey)’i konu etmek, be about, deal with The director’s latest documentary (belgesel) is concerned with famine (kuraklık) in Africa. 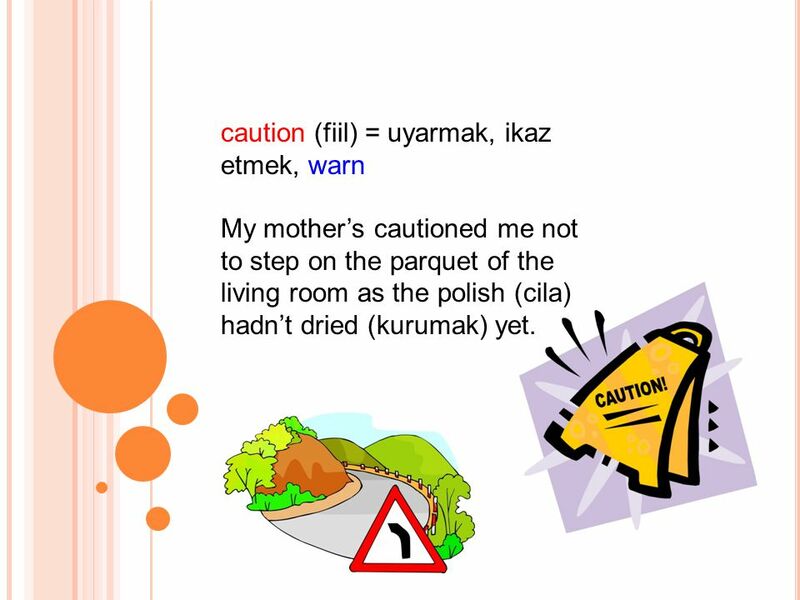 My mother’s cautioned me not to step on the parquet of the living room as the polish (cila) hadn’t dried (kurumak) yet. 16 deliver = teslim etmek, vermek, bırakmak, dağıtmak, mesaj iletmek, transfer, hand over, distribute, send, zıt anl.= keep, retain Following his complaint (şikayet), the airline delivered the lost luggage (bagaj) to Jason’s flat. 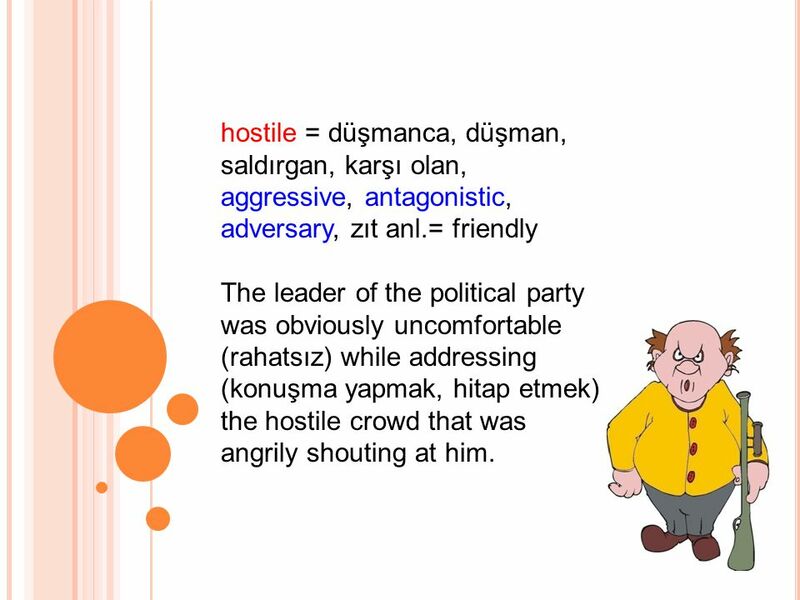 17 hostile = düşmanca, düşman, saldırgan, karşı olan, aggressive, antagonistic, adversary, zıt anl.= friendly The leader of the political party was obviously uncomfortable (rahatsız) while addressing (konuşma yapmak, hitap etmek) the hostile crowd that was angrily shouting at him. The famous actor couldn’t even answer some basic questions about his country’s history. He was unbelievably (inanılmaz derecede) ignorant. We were embarrassed (mahcup olmak) by her ignorant manners (tavır, davranış) at the lunch table. ignore = dikkate almamak, göz ardı etmek, disregard, dismiss, zıt anl.= know, notice, pay attention (to) Safety regulations are being ignored by company managers in the drive to increase profits. = Güvenlik önlemleri, şirket müdürleri tarafından, karları arttırma dürtüsüyle göz ardı ediliyor. Judging by the tone of his voice on the telephone, I immediately understood that something bad had happened. 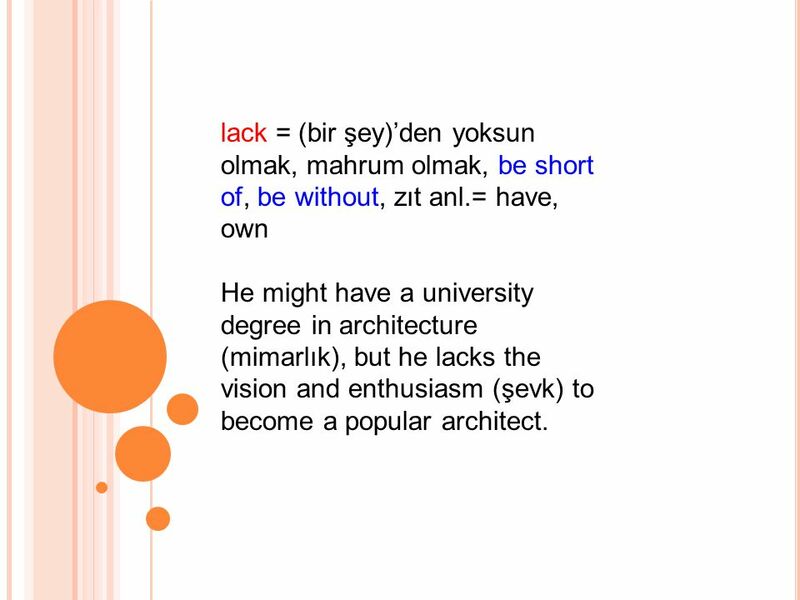 He might have a university degree in architecture (mimarlık), but he lacks the vision and enthusiasm (şevk) to become a popular architect. 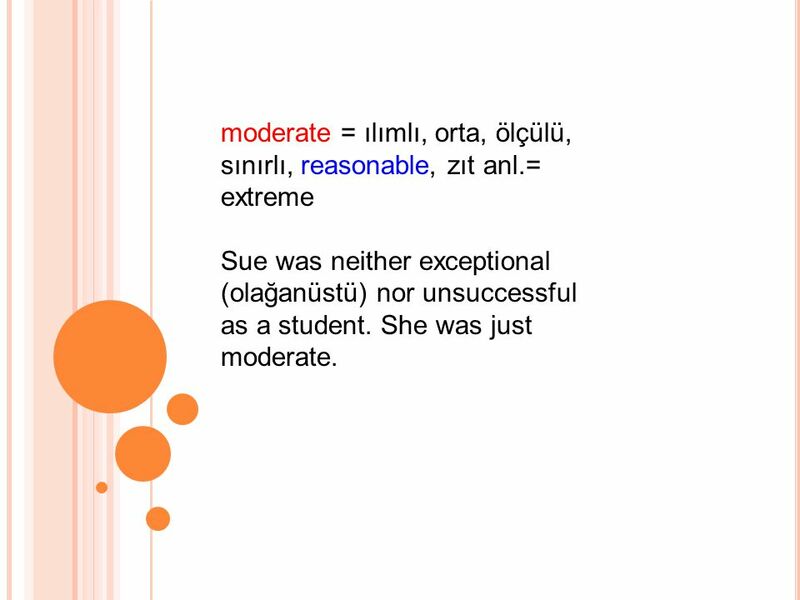 moderate = ılımlı, orta, ölçülü, sınırlı, reasonable, zıt anl.= extreme Sue was neither exceptional (olağanüstü) nor unsuccessful as a student. She was just moderate. 1) The apartment blocks seriously upset the peaceful (huzur verici) landscape (manzara). 2) My mother’s negative remarks (söz, yorum) about my husband have been upsetting me. She had better (...sa iyi olur) change her attitude (tavır). 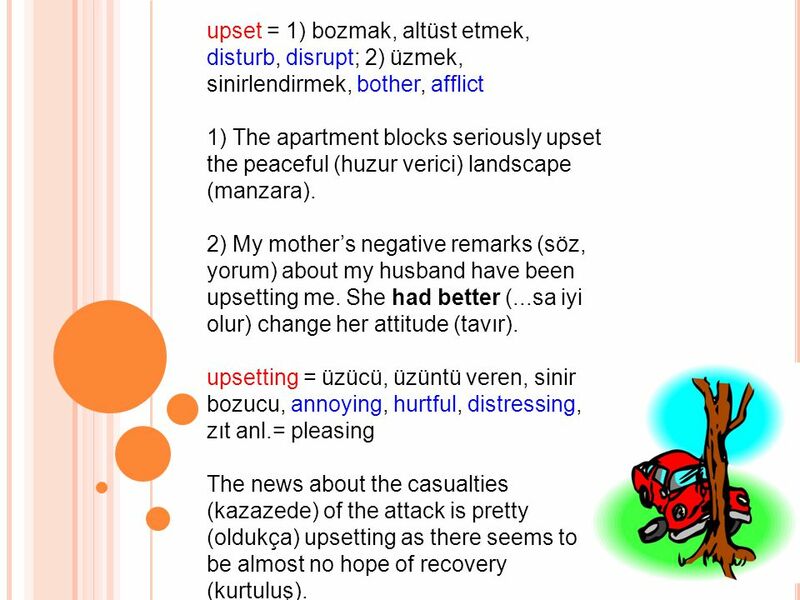 upsetting = üzücü, üzüntü veren, sinir bozucu, annoying, hurtful, distressing, zıt anl.= pleasing The news about the casualties (kazazede) of the attack is pretty (oldukça) upsetting as there seems to be almost no hope of recovery (kurtuluş). 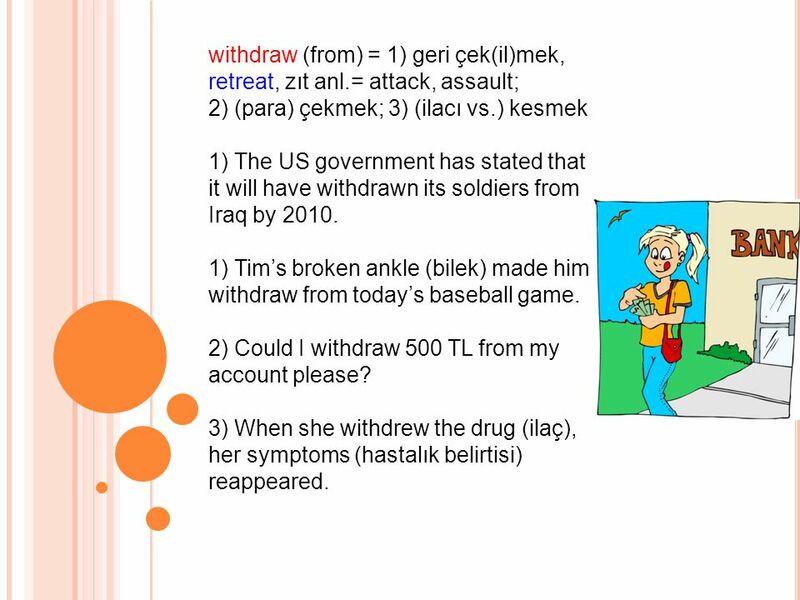 withdraw (from) = 1) geri çek(il)mek, retreat, zıt anl.= attack, assault; 2) (para) çekmek; 3) (ilacı vs.) kesmek 1) The US government has stated that it will have withdrawn its soldiers from Iraq by 2010. 1) Tim’s broken ankle (bilek) made him withdraw from today’s baseball game. 2) Could I withdraw 500 TL from my account please? 3) When she withdrew the drug (ilaç), her symptoms (hastalık belirtisi) reappeared. 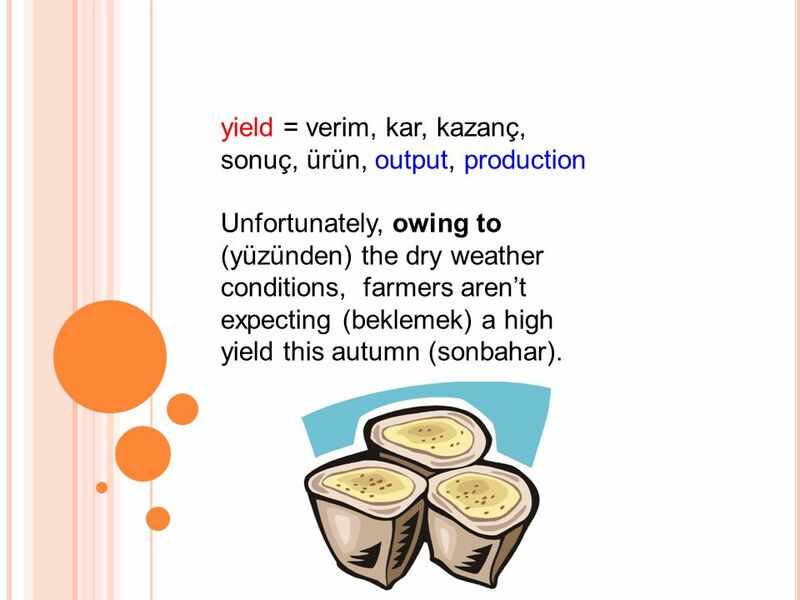 Unfortunately, owing to (yüzünden) the dry weather conditions, farmers aren’t expecting (beklemek) a high yield this autumn (sonbahar). 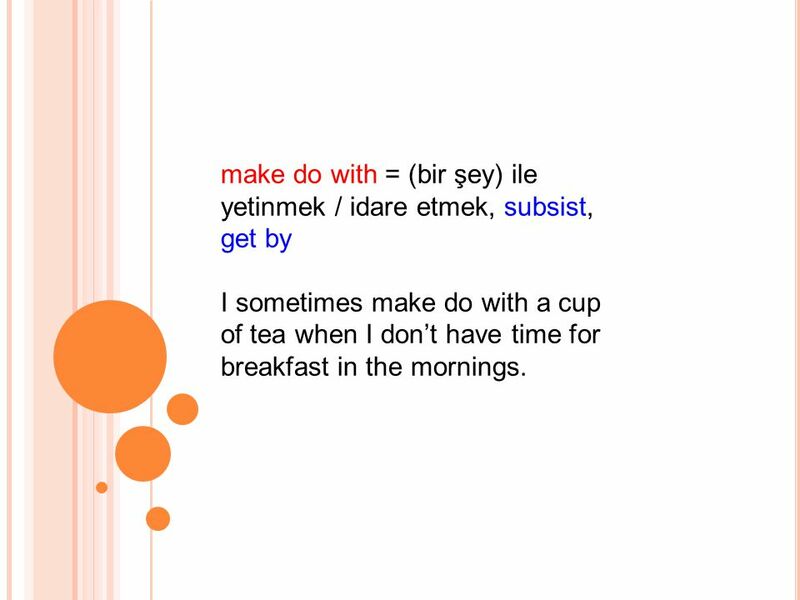 25 vaguely = tam anlamını vermeyecek şekilde, belli belirsiz, ambiguously, zıt anl.= clearly, explicitly I’d just woken up when Ron phoned me, so I vaguely remember what we talked about. I accidentally broke my aunt’s antique vase (vazo). Now, I have to make up for (telafi etmek) it. She had been suffering from severe (şiddetli) back pain (sırt ağrısı) and accordingly consulted (danışmak / görünmek) a doctor. 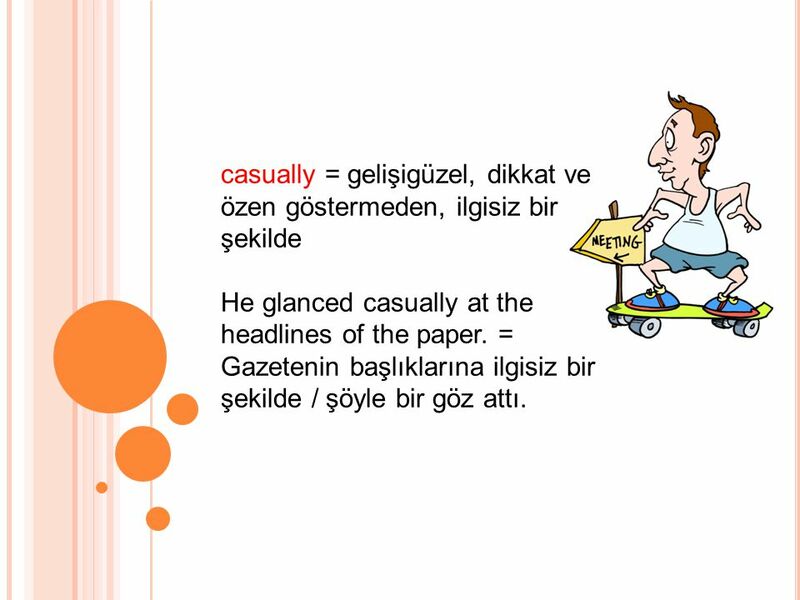 Accordingly zarfının bir diğer anlamı ise, ‘ona göre, öyle’dir: I’ll wait until I have heard from her and act accordingly. = Ondan haber alana kadar bekleyeceğim ve ona göre hareket edeceğim. 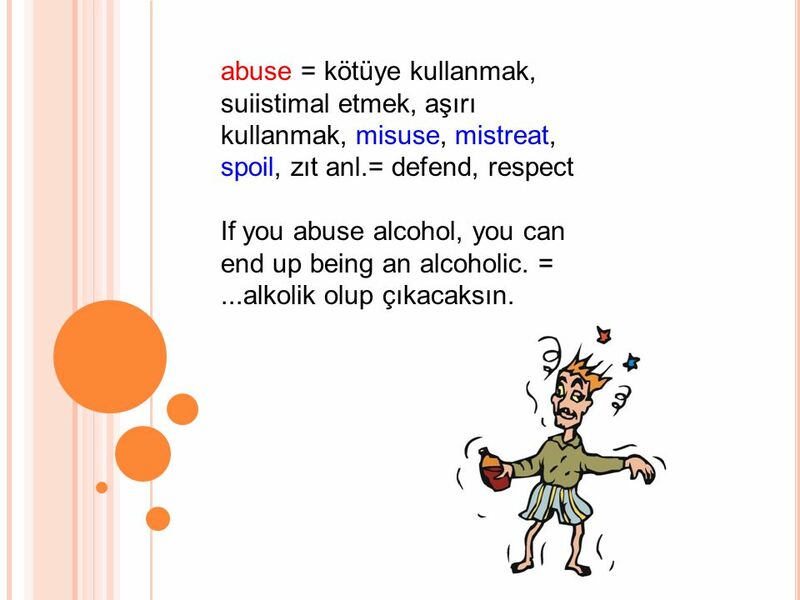 28 abuse = kötüye kullanmak, suiistimal etmek, aşırı kullanmak, misuse, mistreat, spoil, zıt anl.= defend, respect If you abuse alcohol, you can end up being an alcoholic. = ...alkolik olup çıkacaksın. 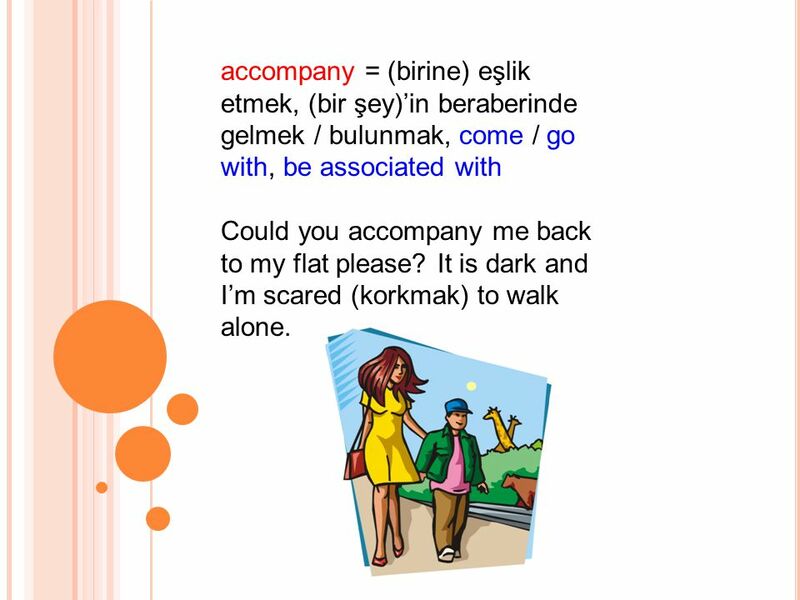 29 accompany = (birine) eşlik etmek, (bir şey)’in beraberinde gelmek / bulunmak, come / go with, be associated with Could you accompany me back to my flat please? It is dark and I’m scared (korkmak) to walk alone. 30 make out = 1) (bir şeyin ne olduğunu) kestirmek, çıkarmak, seçmek, anlamak, çözmek, perceive, understand; 2) başarmak, be successful 1) The man was obviously (açıkça) trying to tell me something but I couldn’t make out his Welsh (Galler, Galli) accent (aksan). 2) It is usually challenging (zorlayıcı) for students to make out in a new school. 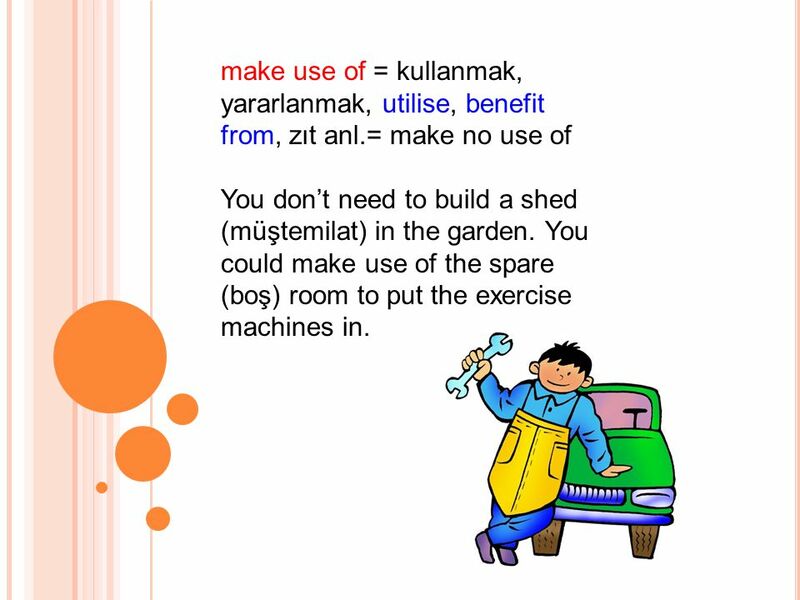 make use of = kullanmak, yararlanmak, utilise, benefit from, zıt anl.= make no use of You don’t need to build a shed (müştemilat) in the garden. You could make use of the spare (boş) room to put the exercise machines in. I sometimes make do with a cup of tea when I don’t have time for breakfast in the mornings. 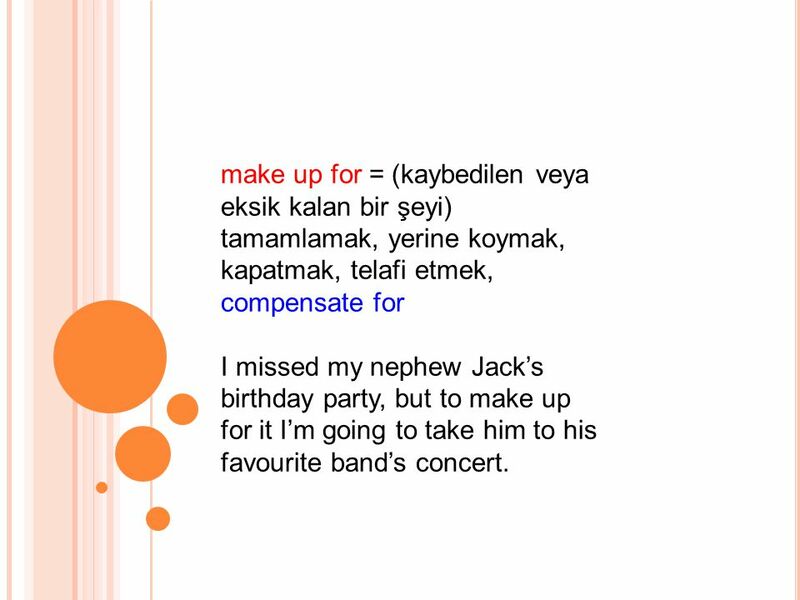 33 make up for = (kaybedilen veya eksik kalan bir şeyi) tamamlamak, yerine koymak, kapatmak, telafi etmek, compensate for I missed my nephew Jack’s birthday party, but to make up for it I’m going to take him to his favourite band’s concert. He glanced casually at the headlines of the paper. = Gazetenin başlıklarına ilgisiz bir şekilde / şöyle bir göz attı. 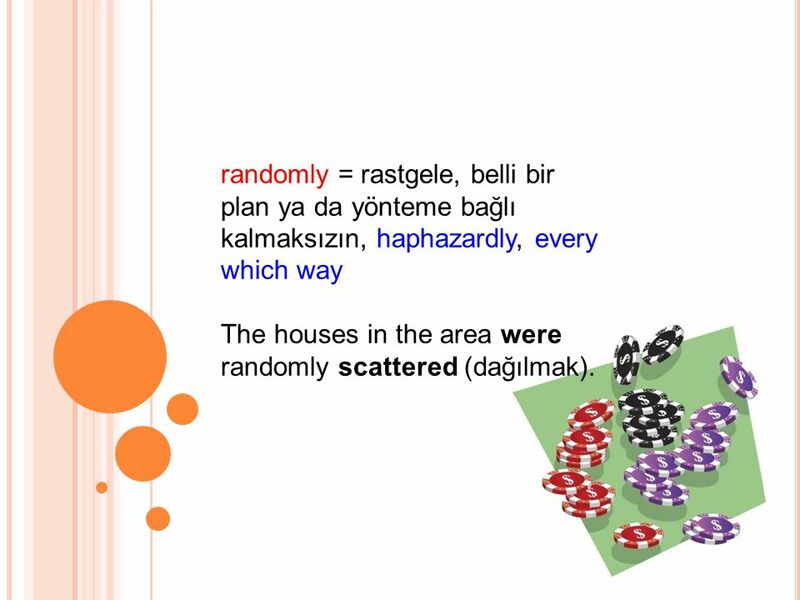 The houses in the area were randomly scattered (dağılmak). 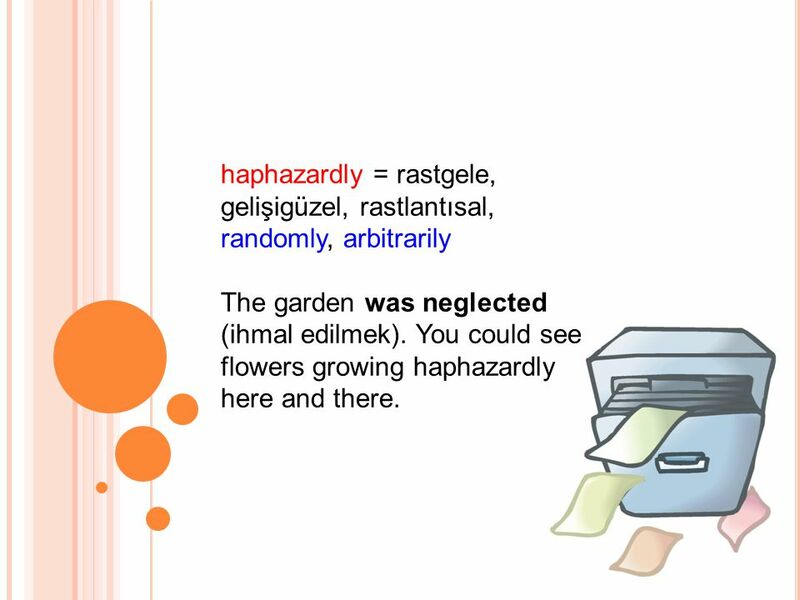 The garden was neglected (ihmal edilmek). You could see flowers growing haphazardly here and there. 1) The open-air concert was spoilt by the rain. 2) I am an only child (ailenin tek çocuğu) but my parents didn’t really spoil me. 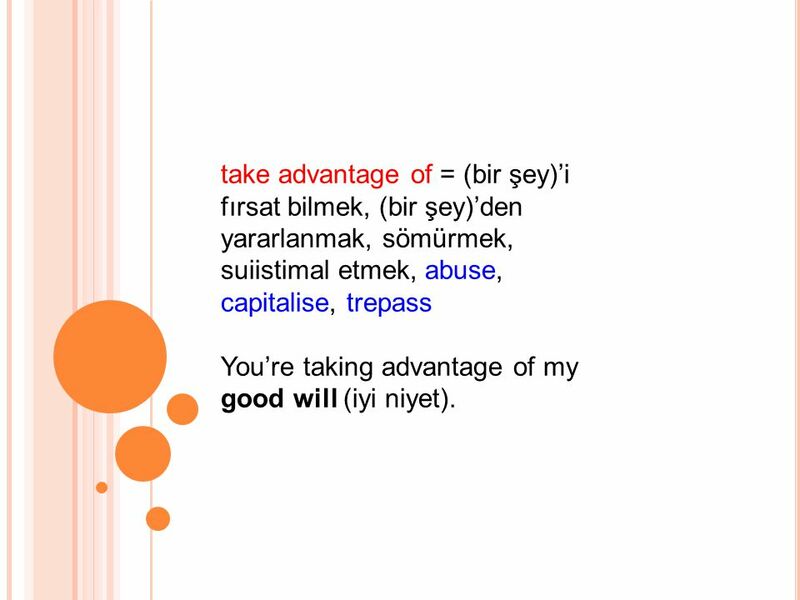 39 take advantage of = (bir şey)’i fırsat bilmek, (bir şey)’den yararlanmak, sömürmek, suiistimal etmek, abuse, capitalise, trepass You’re taking advantage of my good will (iyi niyet).